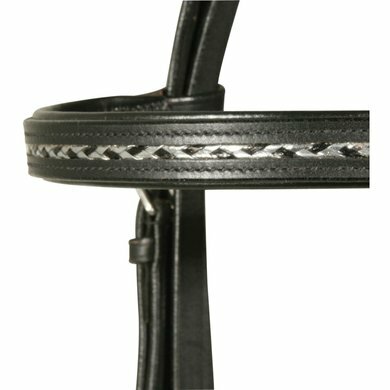 With english noseband and flash strap, black padded and exclusive blacksilver- coloured braid on the browband, including reins. Good head, nice little buddy. No super quality but good enough. Beautifully trained and tough-looking leather bridle for my minishet. The size minishet was still a bit too big for my shet of 85 cm., But with a few holes there that problem is solved and I expect to enjoy my purchase. Also expect the leather of the straps to become slightly smoother, so that the buckles will close more easily. Question: what is the width of the noseband? 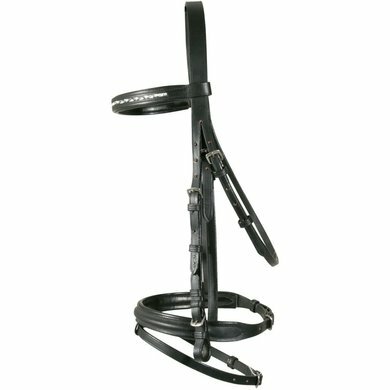 Answer: The width of the bridle is 2.5 cm.